On June 22, 2016, Toronto’s Budget Committee will consider the City Manager’s opening salvo in the 2017 Budget Process. This report signals a dark time for transit funding on both the Operating and Capital fronts. On the Operating side, the starting point for the budget is an assumed “inflationary” increase in the residential tax rate of 2% in line with Mayor Tory’s stated policy. This will yield $52 million in new revenue, small change beside an overall $11 billion budget. Property taxes account for about 1/3 of the City’s total revenue, and so a 2% increase in the tax represents only a .67% increase against the overall budget with the balance to come from other sources. Also, because of the ongoing rebalancing of commercial and residential rates, the commercial tax goes up by only .67% (one third of the residential rate). This pattern will continue until about 2020. Other revenue growth comes from increased assessment (mainly new buildings) and the Land Transfer Tax. The largest single jump in expenses lies with the TTC’s budget, $178 million. This combines the effects of service improvements (some of which carry over from 2016, but now for a full 12 months), increases in base costs for materials and labour, and the implementation of new services or functions that bring unavoidable new costs. These include the transition to Presto and the ramping up of operating expenses for the Spadina subway extension due to open late in 2017, but with pre-opening costs that will accrue earlier. Presto was supposed to be cost-neutral, but during the transitional period, the TTC will bear many costs of the old fare collection system as well as all of the cost of the new one. It remains to be seen whether this will ever balance out considering the TTC’s plan to redeploy Station Collectors for Customer Service purposes within stations. TTC staff have not produced a detailed report showing the costs and savings of old versus new systems, identified whether available savings are being achieved, or when they might occur. An additional pressure on the TTC is the projected shortfall in 2016 fare revenue of $25 million. This could be offset by deferral of service improvements intended to handle growth, but also intended to reduce crowding and make the system more attractive. 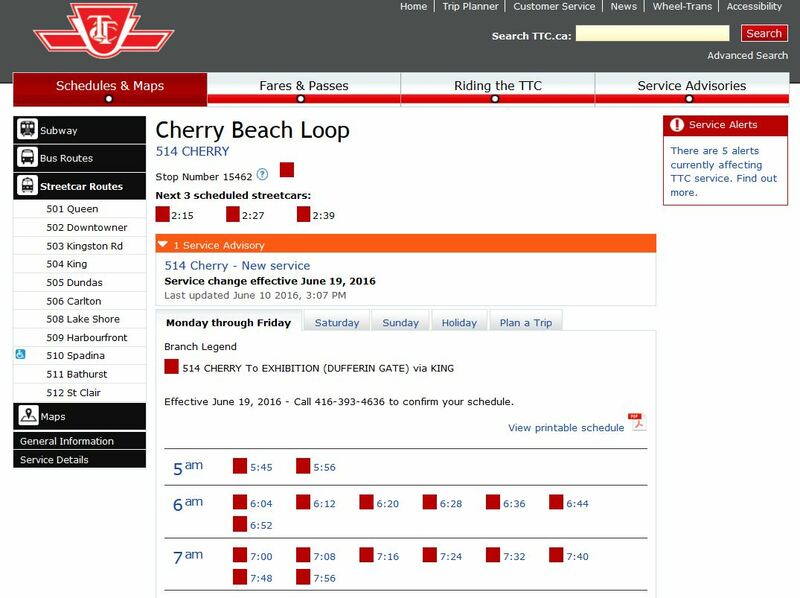 A detailed report on ridership is expected at the TTC’s July 11 Board meeting. The City Manager provides for $12 million as the cost of lower 2017 revenue compared with 2016, and this is additional to the $178 million above. If the subsidy is flat-lined for 2017, this would set it at $493.6 million plus whatever other reserves might be available. A 2.6% reduction translates to $12.83 million, and a 4.1% cut would be $20.24 million. This would be on top of the TTC’s need to find $178 million for 2017 operations, and the $12 million provision for lost fare revenue. Note that this is only the subsidy for the “conventional” transit service. Wheel-Trans faces its own pressures from building demand and new mandated eligibility criteria, and there is no indication of how the City, which funds almost the entire WT operation, plans to pay for this. Clearly the transfer of capital costs now borne by the City generally to riders does not count as “offloading” in his mind. The preliminary City budget includes $12 million for additional TTC fare revenue which, in an era of low or no ridership growth, would translate to a comparable increase in existing fares. The probable TTC fare revenue for 2016 is $1.15 billion [TTC CEO’s Report May 2016, p. 47]. A $12 million bump implies a 1% fare increase, or only a few cents per ride. If there is to be any fare increase, this is an impractical amount. Based on projected ridership of 544 million, the average fare for the year will be $2.11. At the very least, the increase would be 5¢ on the adult fare (corresponding less on discount fares) yielding at least 2.5% more revenue, not 1%. This is still small change compared to the shortfall. The effect of an ongoing low tax policy is that actual spending per capita, adjusted for inflation, would fall by 8.6% over the coming five years. Many accounting tricks that have papered over the holes in past budgets are no longer available. New “revenue tools” are in the news again, although just how aggressive Council will actually be to pursue them is quite another matter. The last time this came up, Council rejected every single new revenue source available to them. The closer we get to the 2018 election cycle, the more averse Council becomes to anything that smells like a “tax grab”. Such is the legacy of the Ford era where City revenue is only considered as a wasted tax, as gravy, not as enabling much needed and valued services. A change in the budget process for 2017 will place the decision (or at least a preliminary one) on the size of a TTC subsidy (and possibly other TTC policies) before Council much earlier than in past years. In effect, the Budget Committee and Council will decide how much the TTC will get before the TTC Board and its Budget Committee even meet to consider the issue. For many years, transit policy debates have been hamstrung by a lack of information about policy alternatives. What would it cost to add service? What would be the effect of a change in fare structure? Where is the outlook for TTC riding, service and role as par of the GTHA’s transportation network? The next Board meeting is scheduled for July 11, and the TTC’s Budget Committee has cancelled all three of its planned meetings to date in the TTC calendar. So much for an active, public discussion of transit options. Is the Board afraid to address these issues, possibly exposing a rift between what transit might be and the Mayor’s lacklustre support for improvements, or are they simply too lazy to do their job? A significant requirement in the City’s budget process is the provision of a five-year fiscal projection. The TTC has resisted providing such information for years, and to the degree it even complied with the request, the numbers were the most basic pro-forma calculations simply scaling up existing costs and revenues with no provision for new programs or policy changes. Of particular importance is the matter of the net operating cost of the Spadina subway extension for which the TTC has yet to produce a number as part of its future budgets. As mentioned above, the City is not even prepared to take on additional costs of TTC-related debt, and want to push this onto the Operating Budget where it will compete with service improvements and any fare discount policies that might be proposed. The first tranche of federal money, the already-announced $840 million, is for “state of good repair” works needed to keep the lights on, not to build new lines or enhance services. The federal money does not represent 100% financing of anything, and if the City adds a new project to the list using federal funds, it must find matching funds of its own from a pool that is already empty. Operating base budgets are to be submitted to the City Manager by June 20 (two days from when I write this). A further submission including suggested expense reductions and any requests for new spending is required by August 2, 2016 [see Appendix 1, p. 22]. To date in 2016, the TTC Board has not had any discussions about budget or overall priorities for where the TTC is going as an agency. Budget subcommittee meetings, including one planned for June 16, have been cancelled, and a full Board meeting to discuss policy directions on April 7 was also cancelled. There are no public documents indicating what the TTC’s priorities might be, or even discussing options for future services, fare structures and priorities for the use of new capital subsidies. That issue was supposed to have been on the June 16 agenda according to CEO Andy Byford at a recent provincial funding announcement, but the info has yet to surface. The Board will meet once, on July 11, before the August 2 deadline, and it is simply not possible to absorb the implications of the options or discuss policies in a single meeting. Even those of us who know TTC budgets in detail need time to absorb all of the information, and I count few of the Board members in that number. In the midst of a debacle over the rising cost of the Scarborough Subway (whatever one’s position might be on that project), the absence of a wider context of the TTC’s future as a transit service, and of other calls for scarce subsidy dollars, is a dereliction of the Board’s duty. The 514 Cherry streetcar had its official opening on June 18, 2016, although regular service will begin on June 19 at 7:45 am. 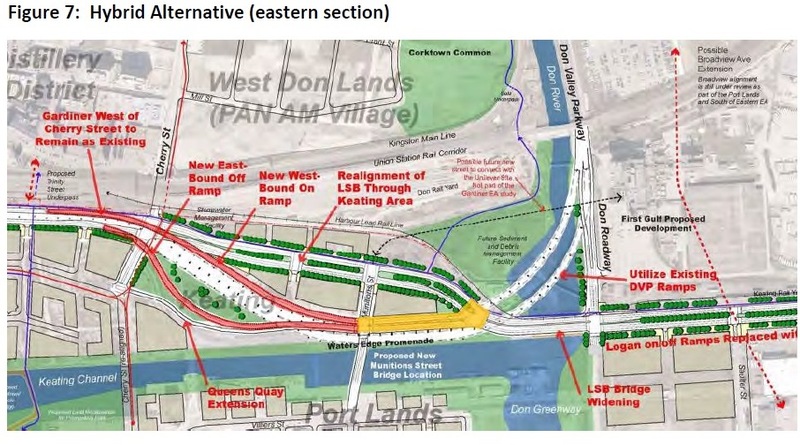 The route will operate between the new Distillery Loop near Cherry and Mill Streets in the Distillery District and Dufferin Loop at the western entrance of the Canadian National Exhibition grounds. This is only the beginning of what should be a much larger network in the eastern waterfront, but work on that stalled thanks to the previous administration at City Hall. The impetus to restart on a serious basis will be funding of the Don River realignment and the active development of the land south of the railway corridor. Some idea of the potential network is shown in the following illustration from the Gardiner Expressway realignment study. Cherry Street will be realigned south of the railway and will cross the Keating Channel on a new bridge including provision for streetcar track. New track along a realigned Queens Quay East will meet up at Cherry and provide the link to Union Station. Also shown (dotted) below is the proposed southerly extension of Broadview Avenue including streetcar track from Queen to Commissioners Street (out of frame below this illustration). Track on Commissioners would link east from New Cherry Street at least to Broadview and thence to Leslie Street and the southwest corner of Leslie Barns. 4421 laden with many passengers and a few politicians set off from Distillery Loop after the usual speechifying such occasions bring, and made a round trip to Dufferin Loop. On its return, the original four cars were still waiting, but in due course the whole parade set off back to the carhouse. An amusing note from our journey was that the car stopped at (and even announced) most of the stops along King Street that are scheduled to be taken out of service on June 19. This will be the only time that a 514 Cherry car served those stops. No, we did not have a photo op at each one to mark its passage. Already there is word that operators are displeased with the absence of a loo at Distillery Loop. It’s a shame the Canary Restaurant isn’t still in business at Front Street where streetcars stop right at the door. I suspect this would have been a favourite layover point. 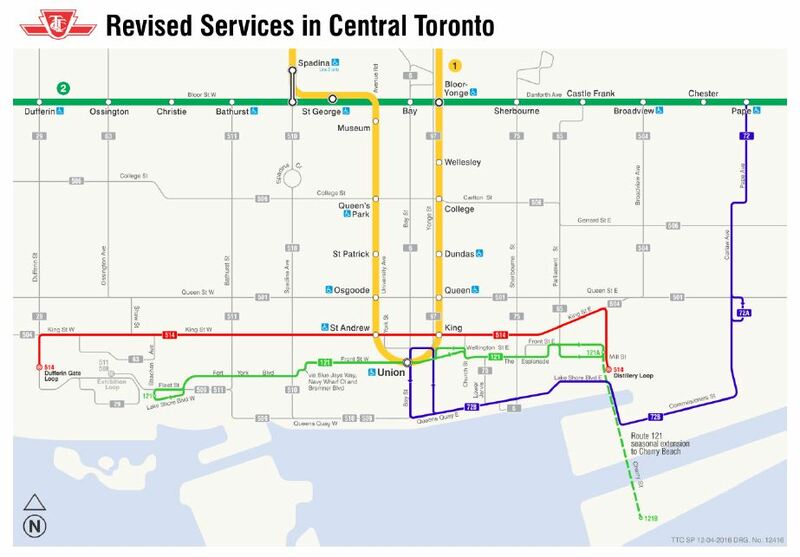 The TTC appears to be slightly confused about the location of the eastern terminus of 514 Cherry. According to the schedule website, this would be Cherry Beach Loop which is somewhat further south across both the Keating Channel and the Ship Channel, a lot sandier, and notably without any track. Not even any Swan Boats.